Learn more about what's going on with Unanet in November. Product news, upcoming events, product education, and more! Unanet 11.0 - Including a New UI! View this SlideShare presentation to learn more about the upcoming Unanet 11 release and get a sneak peek with some images from inside the release! And remember to update your internal training documentation with new screenshots once Unanet 11 is released! November Fun Fact: 1988 - The Morris worm, the first internet-distributed computer worm to gain significant mainstream media attention, was launched from MIT. It was written by a student at Cornell University, Robert Tappan Morris. His intention was to gauge the 'size' of the internet. Attend an Upcoming Unanet University Class! Unanet University offers customers the ability to quickly and economically gain the technical knowledge and best practice methodology to optimize your Unanet system. Unanet University currently offers hands-on instructional learning during all-day courses in our Dulles, VA training facility, as well as virtual course offerings. We would love to have you join us at one of our upcoming Unanet University classes! Join >2,000 Unanet Customers in the LinkedIn Unanet Users Group! We have exceeded 2,000 Unanet users as we count down to the new year! Join your fellow customers in the LinkedIn Unanet Users Group where you can share best practices, ask questions, and receive innovative solutions. Additionally, Unanet employees share upcoming events, webinars, and fun facts! Unanet is traveling around the country, spreading the word about Unanet Financials and additional Unanet capabilities! Register below, and feel free to invite colleagues from your company or other companies that will be interested in learning about Unanet! If you are interested in learning more about Unanet Financials, and are previously committed during the Lunch & Learns, the Customer Solutions team would be happy to schedule a personalized demonstration with you! Contact CustomerSolutions@Unanet.com to schedule one now! Unanet is pleased to announce the following Additional Product offerings. 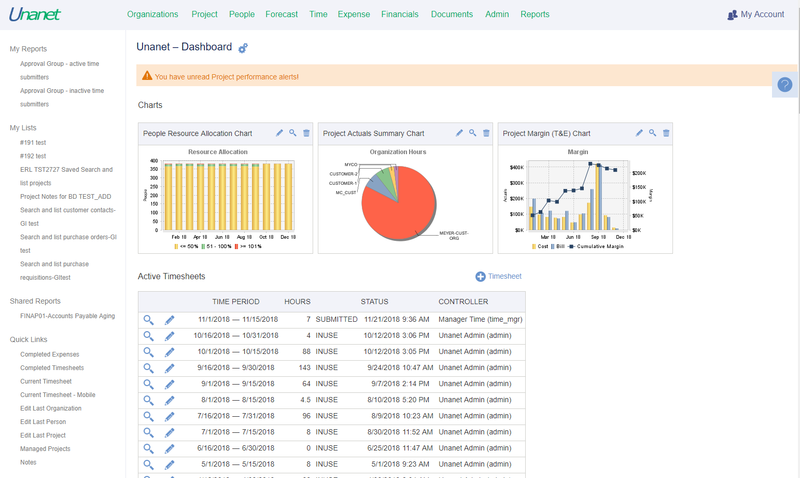 Project Management Score Board (PMSB) – The PMSB is a refreshable web query-based dashboard designed to assist project managers in the proactive management of their direct projects. It is dynamically connected to Unanet to include 49 different project-based metrics, consolidating many pieces of Unanet data to present them as actionable intelligence to the user, with the click of a button, in a matter of minutes. Automated Analyst (AA) – The AA tool offers a wealth of options to ensure data within Unanet remains consistent and adheres to your business practices. The current AA catalog includes 60 standard quality checkpoints, which can provide alerts of changes required or detect and systematically correct values based on your policies and procedures. This leads to more focus for managers on analysis and decision-making, which can have direct impacts on profitability. Webinar - CSM Webinar - What is Unanet's Automated Analyst? PayrollConnect – Unanet offers several Cloud-based payroll integrations that import Person information from the payroll system on an automated, scheduled basis. This offering also includes on-demand exports of time and expense from Unanet to payroll, and on-demand Journal Entry imports from payroll to Unanet. PayrollConnect helps eliminate disparate solutions, deliver real-time data, and lower the cost and complexity of managing the workforce. Hosted Credit Card Import – The Hosted Credit Card Import facilitates the automatic import of credit card files using our Hosted IMU. This offering is currently for American Express Corporate Card users with the KR-1025 file format. Possible future expansions will include other credit card companies and file formats. PerDiemConnect – PerDiemConnect automatically updates Per Diem rates in your system when new rates are published by GSA/DOD, lessening the maintenance burden and preventing unnecessary expense corrections due to dated rates. KC - FAQ - How can I automatically keep my Per Diem rates up to date? Hosted IMU – The Hosted IMU allows you to schedule regular imports or exports on a platform maintained by Unanet, alleviating the need for manual effort or the IT capacity to maintain your own platform. KC - FAQ - What is an IMU and how does it work? Please reach out to the Customer Solutions Team if you have any interest in these Product Offerings! Or simply email unanetcs@unanet.com to request additional information. 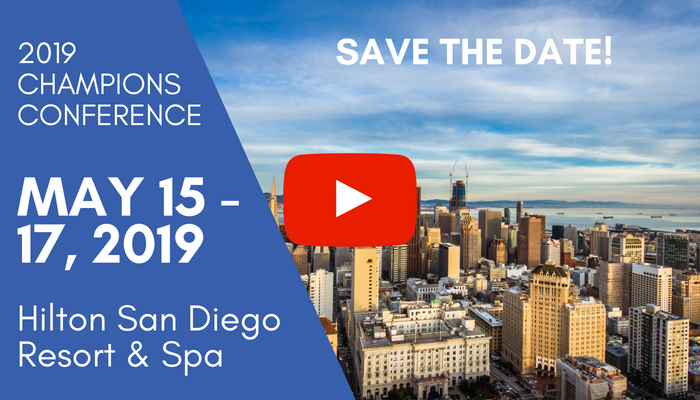 Unanet's Champions Conference is returning to San Diego for 2019! Join us for a day of Pre-Conference Training on May 15, followed by two days of customer insights, a look at the product's future, and presentations by Unanet experts on Thursday, May 16 and Friday, May 17, 2019! Call for Speakers at the 2019 Champions Conference! There is a limited number of customer speaker spots remaining for our May 2019 Champions Conference! The conference will be held May 16-17, 2019, in San Diego, CA. We would love to hear how Unanet has contributed to your success of your team, and/or your organization. We are requesting presentations that are informative, interactive, and appropriate for training, leadership, and management personnel. To be considered as a speaker, please email Zoe Rann. Additional Knowledge Center entries that we thought might interest you! If you would like to learn more about how to navigate the Knowledge Center, please view this entry! Q: Can a locked/extracted expense report be corrected or unextracted? A: A locked/extracted expense report cannot be edited. Result: You will now have two vouchers: the original incorrect voucher with the original approval history and voucher #, as well as the new correcting voucher with its own voucher number that will need to be submitted and go through approval process again. You can delete the original voucher and create a new correct expense voucher (voucher #, approval history, and all line items will be irreversibly removed and disassociated from the original record in the system). Run the Expense Export for the voucher, and add a column called "exp_voucher" to the file. Then on the Admin>Import>Expense screen choose "Allow deletion of LOCKED or EXTRACTED expense reports." Once you click "Import," it will delete the entire expense voucher associated with any rows for that expense voucher number that contain the "!DELETE!" command. Note that the entire expense voucher, its approval history, as well as any/all line items on it will be deleted. Once the incorrect expense voucher has been deleted, you can go back to the copied expense voucher which when copied was created with the status In Use and make corrections to the existing lines as needed and attach the necessary backup/receipts. This newly created expense report will go through the approval process again once submitted. Each month we will include a common or recent question asked of our Support Team and share the response with you! Please continue to reach out to our Support Team at 703-689-9709 or email support@unanet.com. Curious About How You Stack Up Against Your GovCon Peers? In helping government contractors plan and strategize for the upcoming fiscal year, CohnReznick and Unanet have once again partnered to conduct a government contracting industry benchmarking survey. With more than 1,500 contributors this year, representing a wide array of government contractors of all sizes, the 2018 Report is intended to provide valuable insider information for all size contractors, this edition is especially focused on small contractors pursing prime contractor status. Join us on Tuesday, December 4 at 1:00pm ET to learn more! Please follow this link to view all upcoming webinars. If you have some ideas for upcoming Customer Webinars, please submit your fantastic ideas to csm@unanet.com. We are always looking for value-added topics to drive our customers' successes. Please view previous webinars in the Knowledge Center under Unanet functional areas: Knowledge Center. The Latest Unanet Software Build is: 10.3.39. Date Released: 2018-10-26. As a service to our customers, Unanet periodically converts the All History Data files from the DoD source into the Unanet Per Diem Import Format. You can convert the files yourself from your data source of choice, if you prefer. The most recent Unanet Support Site Per Diem file updated was: 10/30/2018. You received this email because you are subscribed to Unanet Customer Newsletter from Unanet.